Exposing the Champion Within - Your Champion Mindset! "I have never seen my team so happy from within and hence so motivated, productive and compassionate. 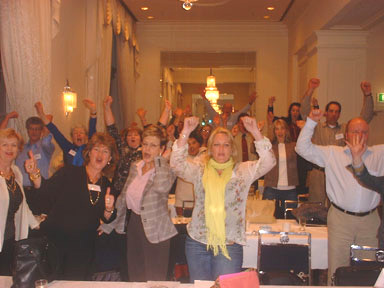 In just 2 days your training in 'Creating Your Champion Mindset' program and your coaching has positively changed the lives of not only those who attended the retreat but also everyone around us, both now, and in the future. We are now busy creating and living our Champion Mindset!" Champion Mindset® Consulting's (CMC) mission statement is to empower our clients' businesses to achieve long-term profitability and success through a variety of CMC services and products. Shelley Taylor-Smith, founder of Champion Mindset® Consulting is booked and rebooked for trainings and conferences where the valued outcome is in training our leaders of tomorrow to think and be Champions today. The 1/2day, 1 day and 2 day seminars and trainings are designed to build the knowledge, abilities and mind tools required to create a Champion Mindset® to achieve peak mental performance. Training and professional development are essential to adapt to change in the fast moving corporate world. Imagine the impact of your corporation if your staff had the focus and motivation to increase their effectiveness, to increase sales and the profit of your company. "Your facilitation was brilliant, your speeches were fantastic and we all walked out feeling 100% ready to turn our dreams into goals. I have never seen a group of 125 people so pumped up and ready to face any challenge that life throws at them. The way you inspired a room full of different personalities, cultures and age groups was truly amazing and everyone walked out to "think like a Champion." Your personal happiness and professional success will be much more consistent, and much more predictable. Your ability to empower yourself for optimum results will be increased. Create patterns of excellence from any role model you choose. Review the Champion Mindset® trainings that I believe will assist your team in achieving their outcomes and goals that will support them both personally & professionally. This mindset workshop teaches participants how to use the latest strategies and techniques from the cognitive behavioural sciences to get in the driver’s seat, take control, so you can design the life and results you really want. If you or your team need to break old paradigms, lead the way in a changing environment, or lift performance to entirely new levels, then this session will provide the keys to successful change. "Shelley’s coaching program is incredible. She is an expert in engaging an audience and encouraging people to be the best they can be. In our weekly employee development meeting all our team said that seeing Shelley present was the best thing that had happened in their week." This program assists to accelerate your team’s personal and professional growth and success. Learn how to operate from a physiology of excellence and how to stay motivated on moving forward on your goals and outcomes in your day-to-day work environment. This training teaches how to use the Power of Belief to achieve anything you want. The size of your success is determined by the size of your BELIEF! So how can you change the way you think forever? Change the way you think and deal with the obstacles and difficulties in your life. Identify the personal changes you need to make --- and then provide the impetus to make them. Teach you how to move past your disappointments, failures and mistakes. Show you just how close you are to moving to the next level of achievement in your life and your goals -- and how to get there. Teach you how to use the most powerful six-word “secret” in the world. Help you learn how to overcome negative circumstances. Banish, once and for all, the fear and limiting belief that you are not good enough, not smart enough and don’t have what it takes. Culture – what separates us from the rest and scares our competitors. The Champion Team program details how leaders and managers can successfully motivate employees by measuring and building the attitude-motivation levels of their employees creating the team culture. Belief and desire are the beginning of all achievement. If one of those key ingredients is missing, success is almost impossible. 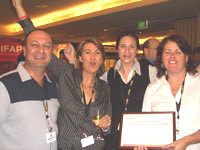 "The seminar was inspirational not just for work but for life!" "Gave me a real lift, felt invigorating and that get up and go feeling." "Your constant high level of energy and focused self motivation is an inspiration to me!" "Great experience, a real eye opener, time to take control of our future"
"A very beneficial & enjoyable way to way to learn to have determination and motivational skills to set my goals personally and for my career." "The whole experience was nothing but positive and incredibly motivating. Therefore, I was very grateful for the opportunity to grow both personally and professionally." Shelley Taylor-Smith, founder and director of Champion Mindset® Consulting develops all Champion Mindset® programs. Combining the tools and techniques, strategies and solutions from her learnings trained in NLP, her success & experience in the 7 consecutive years ranked World No.1 Marathon Swimmer, Success Coach, Shelley Taylor-Smith teaches you how to create what you want right now. For more information on Champion Mindset® trainings and seminars, email Champion Mindset® Consulting now at office@championmindset.com.au or fax +612 9939 0078 or call +612 9939 0048. “Shelley was employed to prepare St Joseph’s 1st & 2nd VIII’s psychologically for the Head of the River. We achieved the prestigious Australian National Schoolboy Champions 2005 title. Shelley is a woman of the highest integrity, totally professional and gifted with her ability to communicate positive messages to a variety of people. “As parents we feel there has been a noticeable improvement in the rower’s all round attitude towards life in general and their rowing, since Shelley has been involved as a motivator and mentor between the boy’s and their coaches at the Joey’s boat shed. From our view, there is a very positive, balanced and harmonious interaction amongst the crew and their coaches that we have not seen before, along with a healthy determination to be as successful as they can be. "Her professional and dedicated approach to every task and project she undertakes impressed all who have worked with her over the years of her involvement in her role with Swimming Australia Limited. Shelley is extremely effective at both individual and team motivation. As coach her involvement saw one of my athletes in my squad go on to win a World Championship title. 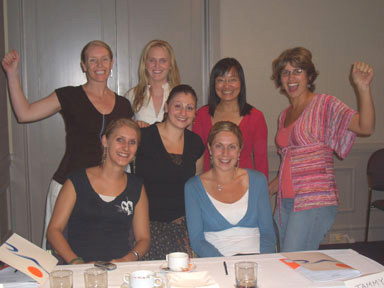 As Head Coach of the Australian Marathon Swim Team I have no hesitation in engaging Shelley’s excellent services to motivate the squad of elite marathon swimmers preparing for the Beijing Olympic Games. Her well-refined presentation skills, ability to engage participants and excellent communication skills enable her to ensure all goals and outcomes are achieved through extremely thorough and dynamic presentations." "Shelley Taylor-Smith is very powerful, passionate and motivating person. The most motivating person I have ever come across, in my time as an athlete and as a coach. And she has that true blue Australian way of speaking that others don't. A real winner." "Balancing a full-time job with study is never easy, but producing an honours thesis while maintaining 50 - 60 hours working weeks seemed an insurmountable task. One weekend with Shelley made me re-think my approach and break it down into small, achievable goals. She inspired me, encouraged me and, most of all, enthused me about the journey ahead - a journey which ended with success! Shelley's approach is sensational. I highly recommend taking the next step, and attending one of her Champion Goal Setting Workshops."